Cavities are one of the most common health conditions worldwide, affecting children and adults alike. One of the reasons that cavities are so dangerous is that they start extremely small, which is why so many people live with undiagnosed cavities. In fact, research has shown that 23% of children, 20% of adults, and 26% of senior citizens have untreated dental cavities, which could potentially spark a deeply rooted and potentially dangerous infection. Here at Newman Family Dentistry, we specialize in preventive dentistry, helping to keep you and your family safe from this all-too-common threat. Here are the signs of cavities, what causes them, and what you can do to ward off issues in the future. The sooner you detect a growing cavity and seek treatment, the less extensive that treatment will be. Teeth that are sensitive to hot foods, cold drinks, or sweet and acidic foods. Sharp or stabbing pain when you bite into certain foods, brush, or floss. Holes or pits in your teeth that you can feel with your finger or tongue. White, brown, or black marks on the teeth. Teeth that are pressure sensitive when you bite down on hard foods. Even the most attentive, meticulous patients can sometimes suffer with undiagnosed dental caries if they don’t attend their regular preventive care visits. The American Dental Association recommends meeting with your family dentist at regular intervals, as determined by your dental health provider. Some patients only need to be seen twice a year, while others may need to come in for more frequent cleanings to minimize plaque and tartar accumulations. Although most people assume that sugar is primarily responsible for oral decay, sugar alone doesn’t damage your teeth. However, your mouth is home to more than 25 different varieties of the oral bacteria Streptococcus mutans, a type of bacteria that creates acids as it grows and multiplies. Over time, these acids damage the enamel, giving bacteria access to the more delicate, inner portions of the tooth. To prevent cavities, patients should pay special attention to brushing and flossing, along with staying properly hydrated and eating a healthy diet. These healthy habits can help to minimize the amount of plaque and tartar that can accumulate on teeth, which in turn provides less of a food source for bacteria and reduces problems with cavities. 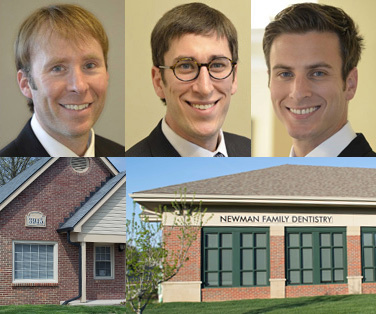 Newman Family Dentistry is dedicated to the prevention of tooth decay, and we will do everything in our power to make sure that you have the skills and tools necessary to ward off these painful problems. Dental fillings are the standard treatment for cavities. After the decay is gently removed and the tooth is cleaned, silver-colored dental amalgam or tooth-colored composite resin is used to fill the opening. Fillings work by sealing the area and keeping the tooth strong and stable. Root canals are essentially a full-tooth cleaning and filling to preserve your tooth. Tooth decay, infections, injuries can leave the tooth's soft tissues damaged, causing pain, dental abscesses, and eventually tooth loss without treatment. However, root canals can preserve the tooth to protect your appearance, your ability to chew, and ultimately, your health. Occasionally, tooth decay has infiltrated a tooth so deeply that a large filling is needed. Unfortunately, large fillings can affect the structural strength of the tooth, which is why dental crowns are sometimes used to repair dental decay. A dental crown is a silver or tooth-colored cap that is cemented over the affected tooth to strengthen the biting surface. Early detection is essential in the war against cavities. If you or someone in your family is experiencing any of the signs of cavities, or if it has simply been a while since your last appointment, call one of our offices in Carmel and Indianapolis to make an appointment. Should you have any questions for us regarding cavities or treatment options, please contact us and we will be happy to help you.